Here’s my new guy! I think he turned out pretty cute. I’m really in to using buttons right now – i seem to want to put them on everything. He is so cute!! The buttons really add to his charm. Although I don’t use them enough, mainly just for eyes and noses, I have tons of buttons. So many that really aren’t good for faces, but would be fun just scattered around on a little body. I went to your blog and saw cutie Cleo the Cat. You’re doing some very nice work. I’ve been rippleing and grannying. I’ve got to get back to my amigurumi. You’ve inspired me. 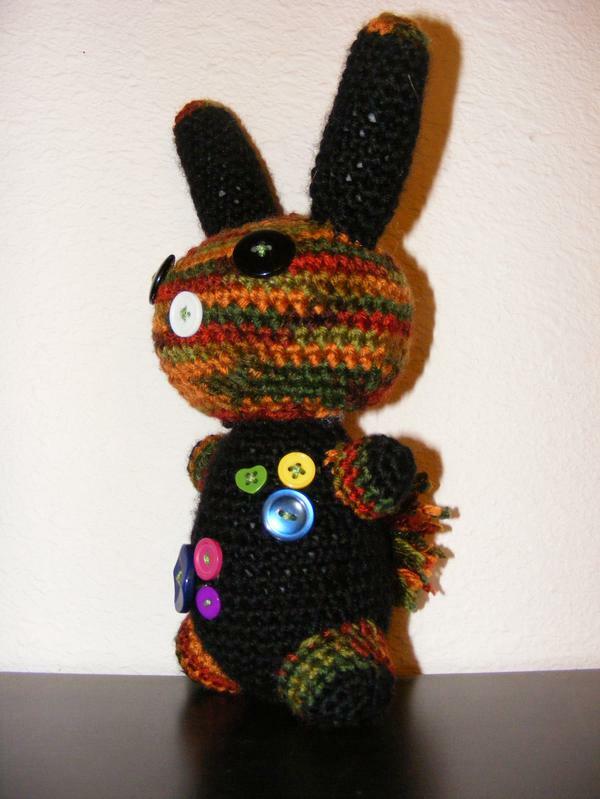 Mr Rabbit is soo cute (and very cool of course he is a mr after all), love the colors you used! Is that a cute little pompom tail I see at the back? Great job! That’s really cute, and the buttons are a great touch. Can never have too many buttons! I will try and work on the pattern this weekend. I never actually write anything down while I crochet – not helpfull when your trying to recreate something! I’ll see what I can do!